For costume ideas from down South, click here. Click the link below to hear a ghost story from Thomasville, Alabama, resident and noted storyteller Linda Vice, who believes spirits protect us and the places they love. To hear more ghost stories from the state, visit their Ghost Trail channel on YouTube. Phyllis Paulsen, a successful financial planner from California, has always had an extra sense about ghosts. “I’ve had this eerie ability to see ghosts since I was a young child,” she explains. So it wasn’t a surprise that when Mrs. Paulsen checked into her suite on the 14th floor of Hotel Monteleone that she had a visitor. 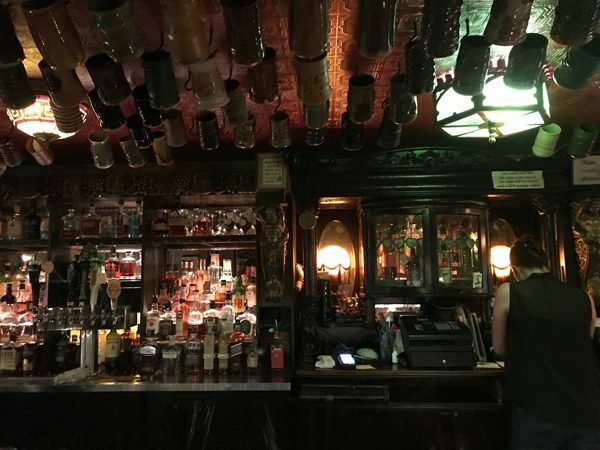 The historic hotel, founded in 1886 and owned by the fourth generation of the Monteleone family, has often heard ghost stories from guests, especially on the 14th floor (actually the 13th floor). The story of the young boy has been repeated many times by other guests, and legend has it that he was the son of Josephine and Jacques Begere who stayed at the Monteleone when they came to New Orleans to attend an opera in the famous French Opera House on Bourbon Street in the late 19th century. Maurice, their young son, was left with his nanny while the couple went off to the opera. Unfortunately, an accident occurred as they were returning to the hotel. The horses bolted when they heard a loud noise and Jacques was thrown from the buggy, killing him instantly. They say that Josephine died within a year of a broken heart. The speculation is that the ghost of young Maurice sometimes roams the halls searching for his parents. His presence is especially felt on the fourteenth floor near the room where his parents were staying. Hotel Monteleone in New Orleans’ French Quarter is one of America’s most haunted hotels, and its spirits have been featured on the Travel Channel and “Today Show.” Generations of hotel guests and staff have experienced a haunted event, like the one in the story above, restaurant doors that open and close by themselves and an elevator that stops on the wrong floor. 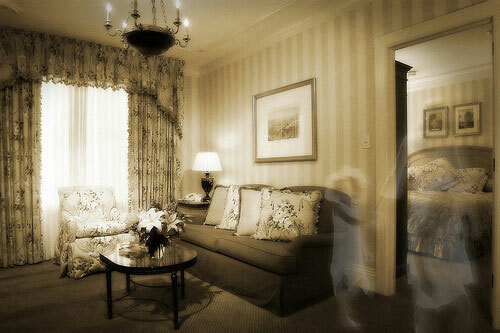 In 2003, the International Society of Paranormal Research investigated the hotel and made contact with more than a dozen entitites. Book your stay at the Hotel Monteleone today to experience this landmark luxury hotel and possibly meet a spirit or two. My parents moved into an old house in the early 1970s that was built in 1917. The lady who lived there for many years was Mrs. Meriwether and she had died some years earlier. My mother always noticed that she heard unusual knocking and noises around holidays and thought maybe it was squirrels or just the old house settling, but always joked, saying it was Mrs. Meriwether. I heard noises all the time when I was at home by myself – because there’s a certain way the floor creaked when you walked through the kitchen – and that noise repeated over and over again. My parents renovated our house around 1987-88. One evening, I was in the den talking with my sister and my father. My Mom came in the room with a puzzled look on her face and asked if we had all been in there the whole time. We had. She had been standing at the kitchen stove (which was right by the dining room door), and out of the corner of her eye saw a hunched-over figure walking through the dining room. She thought it was me sneaking away from my sister’s bedroom with clothes or something. She stuck her head in the door and said, “What are you doing in there, girl?” And when she looked in the room, no one was there. But she distinctly remembers the figure was a female with her hair pulled back, kind of hunched over wearing a long sweater and skirt. After that, we didn’t hear her as much. About a year and half later, my Mom found out from a family member that Mrs. Meriwether had been laid out in our dining room after she passed away. Who doesn’t enjoy a good ghost story? Thanks to a rich — and often tumultuous — history, the South is generously peppered with sites where mysterious sounds shoot neck hairs straight up, spectral shadows float down dark halls and all manner of eerie events take place. Deep in the heart of Dixie, in Montgomery, Alabama, this is certainly the case and, just in time for Halloween, a new business is offering an alternative way to visit some of the area’s spooktacular destinations. 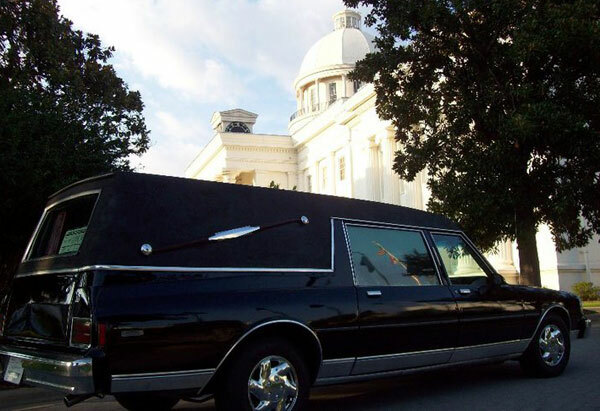 Haunted Hearse Tours in Montgomery is running hour-long tours in the capital city during the month of October. Up to six guests at a time can kick back in a retrofitted hearse while being driven to haunted locales and the spots where some of Montgomery’s most infamous murders occurred. The 1988 Chevy Caprice hearse had to have its back doors modified so they would open from the inside, since that capability wasn’t necessary for the car’s previous passengers. Fontaine also takes guests by Huntingdon College’s Pratt Hall to catch a glimpse of the Red Lady. Over 100 years ago, a young woman who had an unexplained obsession with the color red — she dressed in red and outfitted her entire dorm room in the shade — slashed her wrists in her room one night. 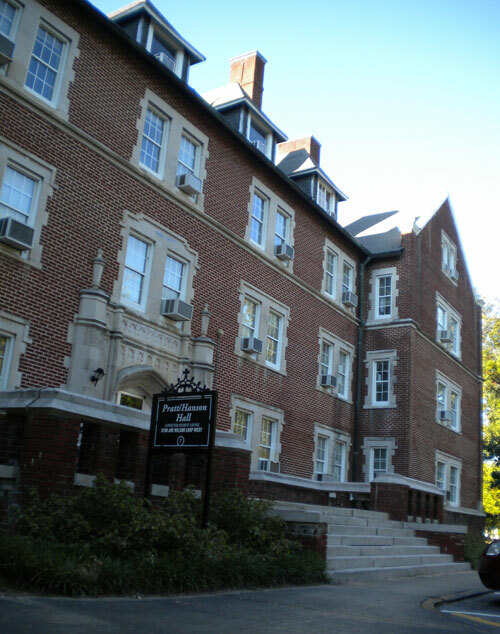 Since her suicide, dorm residents and visitors alike say they’ve glimpsed a lady in red wandering the halls and even flashes of red pulsing from the room’s windows. The site of the gruesome “Feather Duster Murder” is one of Fontaine’s favorites. In 1943, a Montgomery man was beaten to death at his home with the handle of a feather duster. Newspaper reports from the time said he was struck over 150 times, “enough times to kill two mules.” His young wife was accused and stood trial for the crime, but she was found not guilty. The case is still unsolved. All October long, tours leave on the hour from the entrance to the Alley Entertainment District on Tallapoosa Street in downtown Montgomery starting around 7 p.m. and continuing until midnight. Tickets are $10 each, cash only. Visit the Facebook page for reviews and to reserve a seat, or call 334-514-4457. Jennifer S. Kornegay is a freelance writer living in Mongomery, Alabama. Her articles have appeared in multiple local, regional and national publications, including The Montgomery Advertiser, King Kudzu magazine, Southern Living magazine, The Mobile Press-Register and Southern Lady magazine. She served as editor of Montgomery Living magazine until November of 2009. 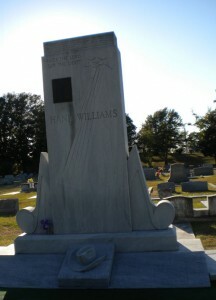 Read a poem by South Carolina’s Fred Bassett about the unusual grave of a little girl in Valley, Alabama. Rediscover America’s original master of horror Edgar Allen Poe this month by participating in Atlanta’s Big Read.